Would you like to consider a uniform/tactical boot that would give you a longer service life? 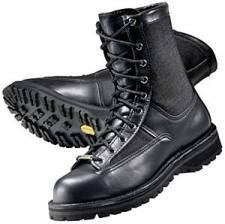 I have utilized the Danner “Acadia” part #21210 since the early 1980’s as a tactical boot, as a member of the Mesa (AZ) swat team, for the Mesa Police Department. My first pair of Danner Acadias lasted for over 12 years of use, with one re-sole on this pair. These boots were used for duty use, as well as heavy backpacking, shooting, and hunting trips, until 1994. I was so pleased with the Acadia’s Service, when our department authorized their use for uniformed patrol, I purchased a shorter version of the Acadia, called the “Patrol” in 1998 and wore these boots on 4 ten hour shifts till my retirement in spring 2006. They have been retired to a yard working boot and backpacking boot and are still holding up here in 2012. I am now considering the first resole on these boots. They are still structurally sound, and have been an outstanding investment. Danner takes a great shine, and there is not a boot out there that can give you the extended service that Danner can. Written by Rick Fife, retired Mesa PD/swat team.